Editorial from Down Syndrome Research and Practice, Volume 8, Issue 2.
. (2002) Editorial. Down Syndrome Research and Practice, 8(2), -. This study aimed to assess how staff ratings of challenging behaviour for people with Down syndrome and dementia affected the self-reported well-being of care staff. Data were collected from 60 care staff in 5 day centres in a large city in England. The data were collected by use of a questionnaire. There was no significant difference between those who cared for individuals with Down syndrome and dementia and those caring for service users with other non-specified learning disabilities without dementia, regarding their self-reported well-being. Self-reported well-being did correlate with staff rating of challenging behaviour in both those who cared for people with Down syndrome and dementia and those who did not care for such service users, with well-being declining as perceived challenging behaviour increased. The findings indicate that challenging behaviour prevention and reduction may be of benefit to both service users and care staff well-being. Donaldson, S. (2002) Work stress and people with Down syndrome and dementia. Down Syndrome Research and Practice, 8(2), 74-78. This case study examined the impact of a series of tutoring sessions on the literacy development of a young woman with Down syndrome. The sessions were conducted within the LATCH-ON (Literacy and Technology-Hands On) program at the Schonell Special Education Centre at the University of Queensland and made use of technology resources in addition to other methods of instruction. The first author assumed the role of participant observer through the reported sessions and acted as an individual tutor to the young woman. Data obtained from an initial screening indicated that the young woman had only limited word decoding strategies when reading text, and consequently, had significant problems with comprehension. Instruction during individual tutoring sessions focused primarily on phonics instruction, as well as other decoding strategies, such as sight word recognition. Specific instructional strategies employed by the first author are discussed. Within the context of the LATCH-ON program, the impact of individual instruction on the development of literacy is examined and discussed. Gallaher, K, van Kraayenoord, C, Jobling, A, and Moni, K. (2002) Reading with Abby: A case study of individual tutoring with a young adult with Down syndrome. Down Syndrome Research and Practice, 8(2), 59-66. A 'positive' approach to supporting a pupil with Down syndrome during 'dedicated numeracy time'? This exploratory study has been designed to consider how mainstream staff can most effectively support pupils with Down syndrome in numeracy. 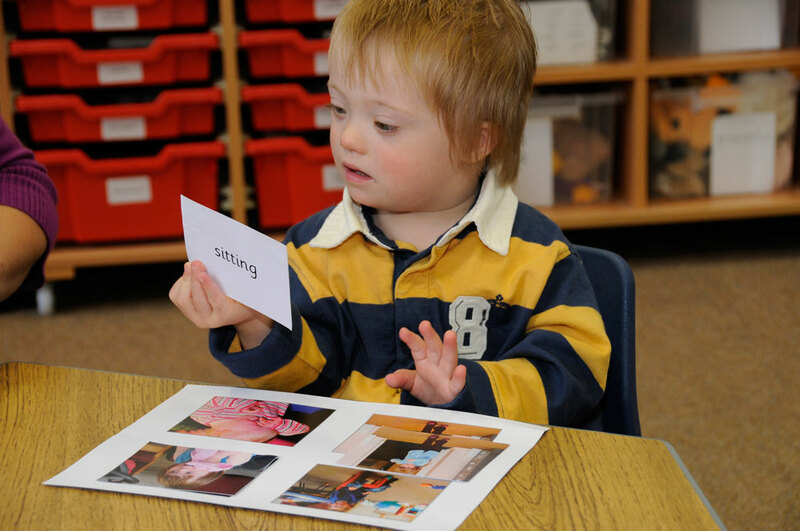 The study is partly based on the work of Wishart (1996, 2001), looking at motivation and learning styles in young children with Down syndrome. An individual case study was carried out during 'dedicated numeracy time', a central part of the National Numeracy Strategy framework, in a reception class. Background information was collected from the educational records of the pupil, initial unstructured observations and semi-structured interviews with the class teacher and Learning Support Assistant. Structured observations were carried out across individual, group and whole class settings. The findings, from this single case study, revealed that, contrary to the expectations of staff, the pupil demonstrated less inappropriate behaviour in the whole class setting, in comparison to individual and group settings. However, the pupil was more successful in his independent attempts at tasks in individual and group settings, in comparison with the whole class setting. The report concludes that it is important to provide pupils with appropriate support to avoid failure, particularly during the early stages of learning. It also recommends that the pupil is able to work within the mainstream classroom and participate, with the appropriate support, in the whole class 'mental maths' session and plenary on a more regular basis. This is a small-scale study and the findings tentative. It does however indicate the need for further research in this area. Germain, R. (2002) A 'positive' approach to supporting a pupil with Down syndrome during 'dedicated numeracy time'?. Down Syndrome Research and Practice, 8(2), 53-58. Background - Individuals with Down syndrome have an accelerated process of ageing which is thought to be associated with oxidative stress. Aim - Since Zn/Cu superoxide dismutase is increased by about 50% in children with Down syndrome, glutathione and other less known antioxidant mechanisms were studied to determine whether there were changes in reactive oxygen species. Methods - Plasma reduced and oxidised glutathione and red blood cells enzymes including acid phosphatase, methemoglobin reductase and transmembrane reductase were evaluated in Portuguese children with Down syndrome and their siblings, who were used as a control group. Results - No significant differences were found between the study and control groups. A negative correlation was noted between total glutathione and acid phosphatase in the siblings without Down syndrome, but not in the children with Down syndrome. Conclusion - Although it is claimed that the production of hydrogen peroxide is enhanced in children with Down syndrome, their antioxidant mechanisms do not seem to be significantly different compared with their siblings. This may result in an excess of reactive oxygen species that could help to explain accelerated ageing in children with Down syndrome. Further studies will be needed to shed light on these mechanisms. Pinto, M, Neves, J, Palha, M, and Bicho, M. (2002) Oxidative stress in Portuguese children with Down syndrome. Down Syndrome Research and Practice, 8(2), 79-82. Little research has been conducted on the reactions of parents, and fathers in particular, following the birth of a child with Down syndrome. Previous studies suggest that gender differences exist in coping strategies and a number of theories have supported this. The current study is informed by Pleck's (1981) Gender Role Strain model which attempts to explain the different socialisation processes males encounter which influence their development in our society. Questionnaires from Carver, Scheier and Weintraub's COPE inventory (1989) were given to parents (n = 150) to measure coping strategies and a number of gender differences were found. Females scored significantly higher than males in seeking instrumental and emotional support; in focusing on and venting emotions; and suppression of competing activities. An additional analysis carried out on parents of young children (n = 74) yielded similar results. The overall findings from the study provides mixed implications for Pleck's theory. Gender differences were found but no value can be ascribed to these different coping strategies. Sullivan, A. (2002) Gender differences in coping strategies of parents of children with Down syndrome. Down Syndrome Research and Practice, 8(2), 67-73. Infants and young children with Down syndrome can be engaging and affectionate. It seems that in the early months of life their personal relations may be relatively 'spared' the effects of limitations in their capacities for information-processing. Yet how far is this the case as development proceeds? In this paper we discuss some ways in which social and cognitive development interact and mutually influence one another over the first year or so of life, and present preliminary findings from a longitudinal study of infants with and without Down syndrome. The evidence suggests that the development of 'triadic'(person-person-world) social interactions may be affected by limited information-processing capacities in infants with Down syndrome, through a complex socially-mediated developmental trajectory. Moore, D, Oates, J, Hobson, R, and Goodwin, J. (2002) Cognitive and social factors in the development of infants with Down syndrome. Down Syndrome Research and Practice, 8(2), 43-52.